View of Bonchurch on the south coast of the Isle of Wight. Bonchurch was developed during the 19th century for the wealthy gentry, who holidayed in the area, taking in the notably milder climate. 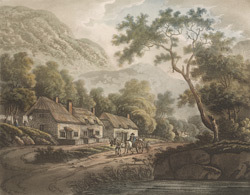 Mason’s Illustrated Tourist Guide to the Isle of Wight, published in the late 19th century contains a description of the village, “Bonchurch is delightfully secluded and embowered with exuberant wood, but has of late years lost much of its retired rural beauty. Enchantingly lovely however, it still remains, and its romantic features can never be affected. It is dotted all over with mansions and villa residences, to some of which extensive and magnificent grounds are attached”.